As the Frostbite Falls Mitten Company inches ever closer to launching its new line of mittens, motivational issues collide with organizational issues. Organization and motivation in the same sentence? Organizational theory and human motivation are usually considered separate disciplines. However, if it is your intention to energize your enterprise with highly motivated team members, it’s important to consider what motivation is and how your team members are best motivated. Equally important is the knowledge of what de-motivates them. Then, you can consider how the ways you choose to organize your enterprise either enhance or diminish the motivation you hope your people possess. Motivation is an internal desire to achieve a goal. In a professional context, that goal might be to do a good job. Personally, it could also be to bag a paycheck that will support the lifestyle you desire. Your desire might be to provide food, clothing, and shelter, or you might have expensive hobbies like flying small airplanes. Your motivation to work could result from short-term pressures like paying the rent next month or long-range goals like providing a secure retirement. You might be motivated to serve a cause bigger than yourself, such as curing a dread disease, making the world safe for democracy, or launching the economic revival of Frostbite Falls, Minnesota. Large-scale or small-scale, profound or modest, internally or externally focused, motivation is motivation, and it’s always based on an emotional agenda. Motivations vary from intense to weak. In every case the intensity of the motivation is tied directly to the individual’s emotional purpose and drives behavior vis-à-vis the work. It can be extrinsically oriented, as in “My desire is to avoid being fired.” It can be intrinsically oriented, as in “Knitting multi-colored mittens expresses the patterns of my soul.” If your primary motivation is avoidance, your vision tends to be focused inward in an atmosphere of defensiveness. If your primary motivation is achievement or expression, you’re more likely to be expansive in your thinking and focus. Whatever the source and nature of your particular motivations, know that everyone else’s behavior is driven by their particular (and sometimes peculiar) motivations as well. Young or old, rich or poor, people don’t do things for no reason. Although the motivation might be fuzzy or imperceptible, it’s there behind every thought, word, and deed. To know what motivates people is to understand and be able to predict behavior. To remain oblivious to what motivates people and impose your agenda on them anyway invites pushback and resistance. Not every work force is as cooperative as the population of Frostbite Falls, Minnesota. By marching and drilling his team members in the snow Bullwinkle did not consider or invoke much in the way of personal or professional motivation. They cooperated because they didn’t know how to or feel safe enough to challenge the CEM1. In some cases they had sufficiently bought into the Great Moose Theory to believe that whatever Bullwinkle decided to do was good for Frostbite Falls. Working through periods of discomfort, fatigue, or frustration when de-motivated is difficult if not impossible. It requires discipline and longsuffering loyalty. Given sufficient motivation, people will endure a lot. If the level of motivation is increased and if the carrot gets large and desirable enough, people will eagerly work through the most grueling and adverse conditions, situations, and circumstances. But enduring military drills in the snow is hardly motivational. It offers no desirable carrot. Worse yet, whatever individuality each team member brings to the job, and with it individual motivation, is intentionally erased. The team might be organized in a neat and tidy way, but their hearts are not going to be in it. How you organize your enterprise has a tremendous influence on your team members and will increase their motivation to perform or decrease their will to work. The debate over militaristic, hierarchical, bureaucratic organizations where people are arranged in columns and silos versus flatter or even molecular organizational models continues even as you read this. If exerting maximum control over people is the order of the day, the military hierarchy is well suited to the task. Lines of accountability and the chain of command are clear. As consultants, Boris and Natasha’s affinity runs in favor of the military hierarchy. That’s what they’re most familiar with. Their experience with motivation is based on avoidance of punishment. So, the drilling and other militaristic activities they encouraged Bullwinkle to pursue were intended to establish the hierarchy of power: generals, captains, lieutenants, sergeants, corporals, and privates. In the military model, the most important factor is that everyone understands and keeps to his or her place on the organizational food chain. It’s all based on who has the institutional authority to punish or discipline whom. In an atmosphere of superior versus subordinate, or power versus weakness, an individual’s ability to contribute to the objectives of the organization is subordinated to the command and control function of his or her place in the hierarchy. Maintaining the rigid reporting structure of the organization diminishes the ability, and usually the motivation, for a team member to venture outside of his or her particular box to contribute above and beyond what is minimally expected. A person trying to contribute a little extra in the way of ideas or effort can unbalance a perfectly balanced hierarchy and trigger punishment instead of encouragement or reward. The net result is that people are often de-motivated. They learn quickly that it’s more in their interest to preserve the integrity of the hierarchy than it is to go the extra mile. In theory, the military hierarchical structure is neat and well-ordered. The militaristic facility is usually neat and well-ordered. It is designed to be as unfriendly as possible to the individual so that everything can stay neatly in place. Military organizational designers hope the brains within the craniums of the workers will be as neat, tidy, well-organized, and well-structured as the organization chart. It all works as long as it stays in the theoretical realm and individual motivation is not an issue. In reality, a rigid organizational structure can institutionalize lethargy and limited participation. The very structure of an organization can serve to de-motivate people who would otherwise find natural motivation in what they do. When it becomes more important to stay in your box than to think outside of it, people begin to feel fenced in. The same inflated self-image that helped Bullwinkle buy into the Great Moose mystique quickly nudged him toward the military hierarchy as recommended by his Pottsylvanian consultants. A hierarchical organizational structure is great if you’re a general. Personal motivation level for generals in a military hierarchy: high. Esprit de corps in a military hierarchy populated by non-military personnel: low. It follows that a deflated self-image makes for a good private. If you’re not used to anyone asking your opinion or if you think your opinion isn’t worth much, you probably won’t be too upset when no one asks for it. The de-motivation occurs when people feel that they have something worthwhile to say but aren’t given the opportunity or, worse, will be punished for speaking out. An organizational concept that rewards silence, or at least doesn’t punish it, is very likely to be a very quiet place. People-centric leaders, like Rocky, who encourage maximum participation from their people, don’t like quiet, well-ordered workplaces. Enlightened leaders encourage the enthusiastic and sometimes noisy participation and involvement from as many people as possible—not because they have a vendetta against hierarchical structures or a need for everyone to hug and sing Kumbaya. They understand and appreciate that maximum involvement and participation, especially around idea generation and sharing, is what gives the organization its energy, enthusiasm, and unique competitive advantage. On the other hand, an open and flexible organizational structure allows space and opportunity for people to expand to fill their container or to reshape the container altogether. Shy and withdrawn people might still be quiet by nature, but should the inspiration strike, they can speak out without being skewered for doing so. In a flexible organizational structure roles that expand and contract in response to the realities of the marketplace and organizational demands won’t unbalance the precious hierarchy. Like a palm tree that can bend almost in half in hurricane-force winds, a flexible organizational design is stronger and more stable than a mighty oak that will snap under similar stress. The military hierarchy appears more stable on paper, but in real world conditions it can’t stand up to ever-changing conditions and elements. People trapped in a rigid hierarchy won’t be able to respond as quickly or effectively to change as those in a fluid and flexible organizational structure, even if they are sufficiently motivated to do so. What does a flexible and responsive organization look like? It looks like whatever it needs to look like to best suit its purpose. As the purpose changes, so does the appearance of the organization. This is most unsettling to strict advocates of hierarchy. Imagine, if you will, the organization chart (some call it the power chart or money chart) coming to life before your very eyes. The silos begin to bend and stretch. The neat little boxes begin to change shape and size. Some become larger, others become smaller. Some extend laterally while others extend vertically. Some are round, some rectangular. Some boxes actually jump from one silo to the next and the lines of accountability are redrawn as circumstances mandate. In short, the rigid image of organization starts to move. If this movement and realignment excites you or, at least, doesn’t frighten you to death, congratulations, you’re not stuck in ancient Napoleonistic notions of military hierarchy and bureaucracy. You might even be an advocate of a molecular organizational structure. Work cells expand and contract as needed to meet the internal and external demands of the organization and the people it serves. Work groups take on more cells or teams as needed and then unlock and regroup when and as needed. It’s a wonderful thing. People tend to attain and maintain higher levels of emotional and mental engagement when they are challenged in new and exciting ways all of the time. Cynicism and the sense of stagnation are minimized in a flexible organizational design. But even the molecular organizational model is only as good as its leadership. The move to a more flexible and people-friendly molecular concept doesn’t mean that people should not be held responsible. Oh contraire. In fact, a molecular design requires more flexible, adaptable, maneuverable, and vigilant leadership. Hierarchical leaders rely more on the imposition of their institutional authority to maintain order and demand performance than do leaders in molecular organizations. Leaders in flexible work environments must constantly connect the dots between what needs to be done to benefit the organization’s internal and external customers and the best ways to go about it. It’s easy to see how a leader who depends solely upon the imposition of institutional authority can become unhinged when the rigid supporting structure is pulled out from beneath his feet. A leader who has developed the fine art of motivating people by keeping them aware of the purpose and value of their work is much more powerfully positioned to elicit great performances from employees regardless of how rigid or flexible the organization is. 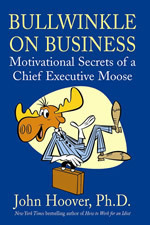 Great Mooses don’t generally have that enhanced ability; they don’t need to if they’re sitting atop a hierarchy. Molecular managers need to be good roller skaters; alert, well-balanced, and ready to slide in any direction at a moment’s notice. How long has it been since you or anyone else has actively discussed the structure of your organization and its impact on motivation? Is there a person trained in organizational development on staff at your organization or available for consultation? Can you, given your current position, prudently convene a summit conference on issues of organization? If not, is it appropriate to request one? Have you done your homework to determine how much organizational issues are affecting your specific area in terms of efficiency, productivity, and motivation? In studying your current organization, can you identify how it was intended to be structured and function versus how it’s really structured and functioning? Can you identify and articulate ways that altering your organizational structure would improve how you meet or exceed organizational goals and customer expectations? If you plan to initiate a dialogue about organization and the ways it affects motivation, yours and others’, how do you plan to keep it focused and productive? How can you expand the discussion to areas beyond your own and stimulate conversations about crossover potential and interdisciplinary cooperation? Remember that your emerging leadership style is based on engaging people who are aware of as much, if not more, of the organization’s activities than you are. You already know there are good reasons to keep your people involved and to keep their personal visions and business concepts in the forefront of your consciousness and theirs. Keep that information fresh by having conversations often about personal visions and business concepts. To deal with issues of organization or reorganization without that information, or to simply ignore it, could render the entire exercise a waste of time. Do: Keep the conversations going and frame them in the context of organization. Check in to see if the people who are closest to the grindstone are familiar with the organization’s design and how much they consider such things. Don’t: Exclude people because they lack formal training in Organization Development. If you’re dealing with people who understand the questions and know how things are really working, that’s education enough to make their input valuable. Do: Ask for direct feedback about how the structure functions and affects people at a tactical and emotional level. Have people explain how they feel about their own motivations. Do: Pull apart processes and procedures to examine why things are being done the way they’re being done, especially if you haven’t been around long enough to know the original reasoning. The people who know best should be front and center in your conversations. They know if the organizational design is an impetus for progress or an impediment. By now, if you’ve followed the cow paths, you know who knows the answers or at least the most reliable information. These people should be your best friends. You have at your fingertips the historical knowledge of how things started getting done the way they currently get done. More than that, you can be the trailblazer who makes it possible for your people to have direct input into new polices, processes, and organizational design. That’s one of the greatest morale boosters you can put into play. You can’t help but increase motivation by encouraging involvement like that. The Leisure Land knitting club was about ready to begin production when they ran into an organizational/work process/communications snag. Boris and Natasha look at each other and then back at Rocky and Bullwinkle.